Copenhagenize.com - Bicycle Urbanism by Design: Cargo Bike Armada in Copenhagen! Cargo Bike Armada in Copenhagen! 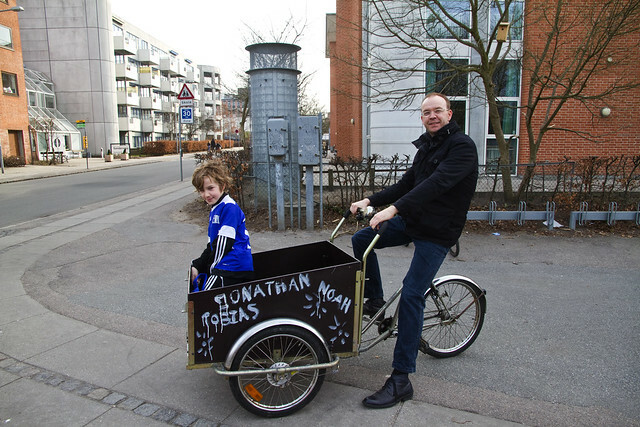 My good friend Mads and his son Tobias on their way to football. Copenhagenize Consulting are well into our kick-off meeting in Copenhagen for the launch of the EU project CycleLogistics, which we are a partner in. Mary blogged about it the other day. A strong team of stakeholders from all over Europe are in Copenhagen to meet up and plan the next three years of the project - as well as to be inspired by the cargo bike goodness here in the City of Cyclists. During the conference all manner of cargo bikes are employed to cater to the group but tomorrow - 18 May 2011 - will be rather special. We've gathered an impressive armada of cargo bikes together for inspiration. Not only manufacturers but also people and companies who use cargo bikes for their businesses. If you're in Copenhagen and want to see the armada, we'll be at Islands Brygge 37 - on the harbour side of the street - from 11:30 to 12:30. Never before will such an array of cargo bike solutions be gathered in one place at one time in Copenhagen. Hey. That's what we do at Copenhagenize Consulting. Follow @CycleLogistics on Twitter. We'll be setting up FB and blog/website shortly. Hvis du er journalist og gerne vil være med kom gerne i det ovennævnte tidsrum og find mig, Mikael Colville-Andersen. Jeg er nok tæt på pandekagecyklen med Nutella omkring munden. Du kan tale med vores venner fra de andre lande som er med og høre hvorfor de er inspireret af KBHs ladcykel kultur som en løsning i andre byer.